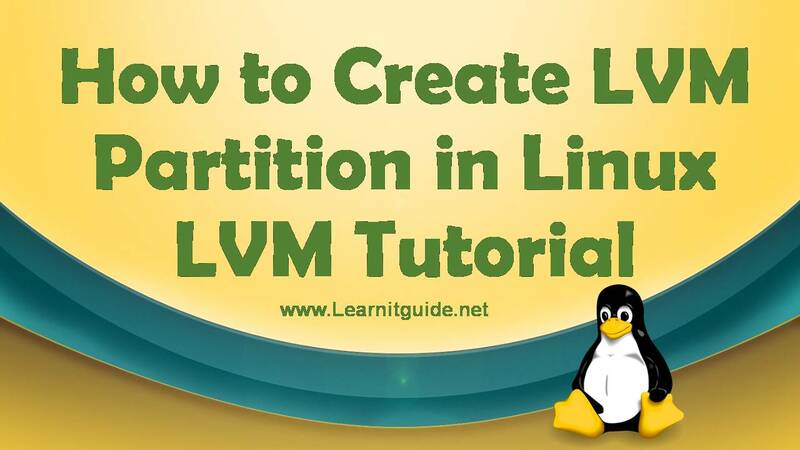 This post explains you how to create a LVM in Linux? LVM - Logical Volume manager is a disk management solution that allow administrators to manage disk space more effectively. LVM allows us to to add, remove, resizing the size online in the existing volume without taking any downtime. How to create a LVM in Linux, these are the below steps to be followed. 1. Select or Identify the correct disks to be used for LVM. 2. Create a Physical Volumes(PV) on the disk. We need to identify the correct disk which are to be used in the LVM using the fdisk command or any other disk management command. For example, Lets say we have two 10GB disk /dev/sdb and /dev/sdc are available. 2. Create a Physical Volumes (PV) on the disk. Once identified the correct disk as /dev/sdb and /dev/sdc, We can create the physical volumes using pvcreate command as shown below which initialize a disk or partition for use by LVM. Physical volumes (PV) are the partitions on hard disk, or hard disk itself. PV are the base of LVM structure and referred as physical volumes. Two physical volumes are created. To view the PV's information more, we can use the below commands, each command has its own output format and its upto the administrator which one to be used. pvscan is a command to know about the overview of the Physical volume. PV /dev/sdb lvm2 [10.00 GiB] => Physical Volume 1 newly created. PV /dev/sdc lvm2 [10.00 GiB] => Physical Volume 2 newly created. pvdisplay is a command to display with attributes like size, physical extent size, total physical extent size, the free space, etc. VG Name ==> If the disk is assigned to the any VG, that VG Name would be shown here. PV Size 10.00 GiB ==> Size of the physical volume. "/dev/sdc" is a new physical volume of "10.00 GiB"
Note : PE – Physical Extents are nothing but equal-sized chunks. The default size of extent is 4MB. If you want to view all physical volume information, we can use "pvdisplay" without any argument. Volume groups are nothing but a pool of storage that consists of one or more physical volumes. Once you create the physical volume, you can create the volume group (VG) from these physical volumes (PV). Use the vgcreate command to create a Volumegroup on the physical volumes. We should specify the volumegroup along with the command as shown in below command. Where "datavg" is the volume group and /dev/sdb, /dev/sdc are the physical volumes. To view the all volumegroup information, use the "vgdisplay" command without any arguement. To view the specific volume group information, use the below command. This command will tell you the volumegroup information along with the phyical volume details. Using volume group(s) on command line. Cur PV 2 ==> Number of current PV associated with the VG. Act PV 2 ==> Number of active PV associated with the VG. VG Size 19.99 GiB ==> Total size of VG combined with two PV. Alloc PE / Size 0 / 0 ==> No space is used from this VG. Free PE / Size 5118 / 19.99 GiB ==> 5118 PE or 19.99 GB is available in this VG. After creating the volumegroup, use "lvcreate" command to create the logical volumes (LV) within the Volume group (VG). As we have seen in the "vgdisplay -v datavg" output, 19.99GB free space available in the volumegroup "datavg". Lets create a Logical volume of 10GB "datavol1" using the command "lvcreate" as shown in the below. Where "-L" is the option to specify the volume size and "-n" to specify the logical volume name. At last specify the volumegroup, so the new logical volume will be created under the volumegroup datavg. To use the full free space available in the VG ie. 19.99GB, Execute the below command. To view all available logical volume, use "lvdisplay" or "lvs" command. Use lvdisplay command with logical volume name as shown below, to view the specific logical volume with its attributes. VG Name datavg ==> This LV belongs to VG datavg. LV Size 10.00 GiB ==> Size of the Logical Volume. 5. Create a filesystem for the logical volumes. Lets create a filesystem, so the logical volume will be ready to use. Once filesystem is created, mount the Logical volumes and start using the volume.